I have left reviews on Amazon. I've never left a bad one though. I figure there's something out there for everyone and just because I didn't care for it doesn't mean someone else will feel the same. I never take a book or enter a contest that stipulates I review it. If I'm lucky enough to get a book for free, I just can't give it a bad review and I have to be honest. I usually only read reviews for authors I've never read before and take some with a grain of salt lol. And I would hope things are spelled correctly. I also don't like anonymous reviews - especially one stars. I recently read one that wasn't even about the right story!!! I don't leave "negative" reviews either. If I didn't the book, then I simply do not leave a review. I've never written a review. Always felt I wouldn't be able to summarize the story that's concise and helpful. I understand your reluctance - that's how I felt before I gave it a try. I also believe readers are not "required" to leave reviews if they bought the book or borrowed from the library. I do review a book from time to time. It's usually just a few sentences. I mostly just say what I liked about a book. Please please please let us know when if the book is written in 1st person or 3rd person point of view. I do not read first person point of view! In the past I have written reviews and I can tell you it is no easy. Aloha, Dani! Great suggestion about 1st versus 3rd person. I agree that writing reviews can be a challenge. I haven't left a review in awhile. I appreciate the rules above. When I read a book that hits it out of the ballpark for me I worry I won't be able to do it justice. Thanks for posting & your thoughts on reviewing. Aloha, Carol. As I wrote above, I understand your reluctance. You can always just rate it with a star. Any review is acceptable ... but simply enjoying the book is too. Aloha, Natasha. I admire that you have confidence in posting your thoughts, whether or not it is a "positive" or "negative" review. I enjoy reading a variety of reviews! A great list! I review on Goodreads and try remember to leave one on Amazon as well. Books I receive through the bookblog I help at get my reviews posted there. I typically purchase my books from bookstores, local or B&N, so I forget to go to Amazon...even though my author friends have let me know how important this is. I need to get better!! I love this new post theme and I'm looking forward to seeing what questions you get! Feel free to send your questions, too! The only thing I would add is that three stars is not bad in a review. I've had several authors ask me why I didn't like a book and I have it 3 stars on Audible. To me, that means it's average; and let's face it, most of us are average and what's wrong with that? I exclusively listen to audiobooks these days (over 100/year), so it's hard to leave a review when audiobooks are unavailable for one of favorite authors. Yes! The starred system reflects a variety of emotional responses to a book. My biggest pet peeve are the reviews that summarize the story. I can read the back blurb if I wanted that!! DON'T give me the story - I want to hear if it affected your emotions, if you laughed, if there were too many characters, if the story flowed well, etc. I try to put all of that in my reviews. What I don't understand is why Amazon makes it such a game: how many reviews, how many 5 stars, when reviews are posted. Seriously, I just want to be able to read reviews and see if the book is for me. If I don't know the author I will read reviews and then the sneak peak Amazon gives you of the first chapter. That way I can find out if I like the author's voice. I like reading the low star reviews because sometimes they will make me WANT to read a book. If the book touched a nerve in someone then that usually means it is emotional and will give me a good read! I like your #5. I feel Amazon has made the relationship between authors and readers not friendly anymore. I think authors have to try too hard to get reviews that they miss the actual talking with readers about the story itself and just getting to know readers. I feel bad for the authors! Why can't reading and writing books just be a most enjoyable experience with no strings attached? Yes! I understand the need for authors to "play the game" ... but that is a game between authors and Amazon, not authors and readers. I also agree that recapping in the review is redundant. Thanks for this information! I sometimes do reviews but only brief ones! I don't want to give up plot lines, etc. Brief reviews are good ... and appreciated! I certainly appreciate that you comment on my blog! I enjoy writing reviews. I am starting my own blog and I liked what you said. Yeah to a new blog! I left a street teams when the author wanted to manipulate reviews. I didn't turn her in to Amazon. Aloha, Denise. I am saddened that you had that experience - I think some authors loose sight of what reading is all about - a personal experience. Aloha, Kim! I thought your post was very thought-provoking. I love reading the different ways people write reviews although I don't enjoy those that give the entire story. Once I am told everything that is going to happen, why read the story? 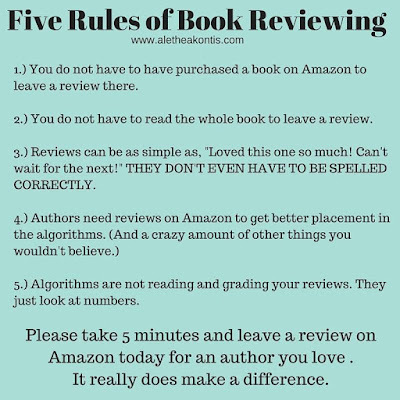 I have the hardest time writing reviews for books I didn't like, especially since I know the things that bug me may not be an issue with someone else. I think an important thing for those writing reviews to remember is that there is no need to be mean with your comments! Aloha, E.L.F.! You raise good points about being honest but being polite. While I am not comfortable writing a review for a book I did not enjoy, I do appreciate the opportunity to read a wide variety of reviews for books I am considering. Hi there. You know I write reviews :) I'm actually behind with my reviews. I write them, good or bad. 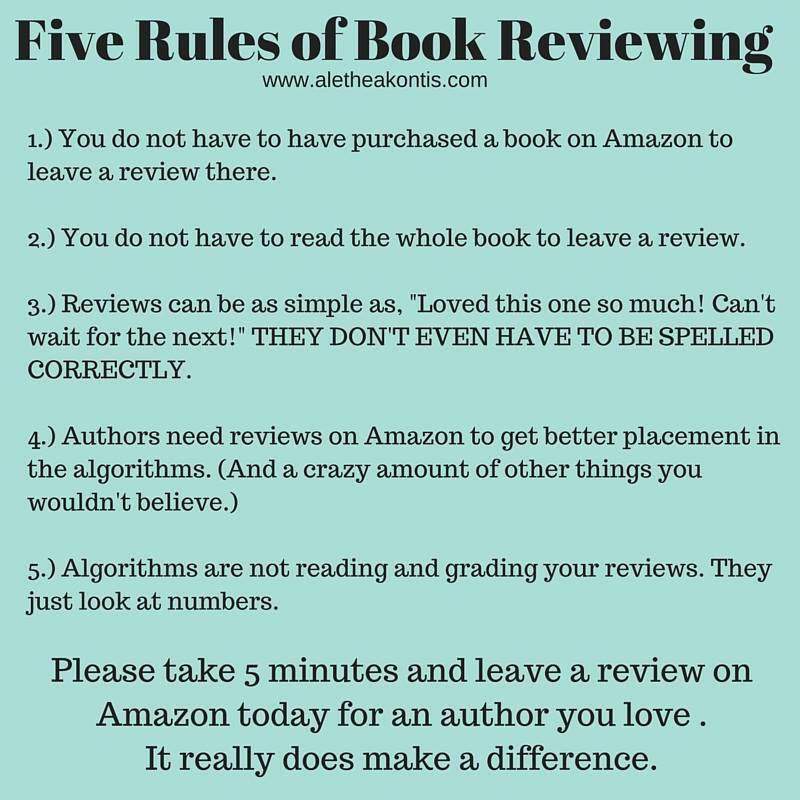 Negative reviews are actually much harder to write, but I think they either help a reader to make an informed choice or will help the author to maybe fix an issue. I like looking at the low ratings. If the reviewer mentions something that I cannot stand, then I don’t have to bother with the book, but if it’s something that doesn’t bother me, then I will likely enjoy the book. And, yes, First Person vs Third Person in a blurb should be a must. I never buy without a sample, because I don’t know how many times I thought something sounded good and then it was written in First Person. I do not enjoy First Person.